Firstly, and I haven’t asked this before on my Monday Author Spotlights, how are you? What did you have for breakfast? I’m so so so good! How are you, sweets? Hmm… breakfast…. A sunrise sandwich. My favorite. I'm good! Thanks for asking. Now, I know you’re a busy woman juggling work, home life (hi Jay!) and your writing. How do you do it, Priya? *Jay giggles* It’s always a huge struggle to find the time. But during the day, while I’m working or playing with jay or cleaning or running or pretty much if my mind is idle, I’m plotting. I have these mini-conversations inside my head trying to figure out what’s next in the story! Like most people listen to music, I plot during those times. Several times, I’d come back from a run and I’d yell to hubby that I FINALLY FIGURED out why so and so was being a baby. Needless to say, he thinks I’m crazy. Oh but you are sometimes. In a good way. *winks* So tell me, what else are you into aside from reading and writing? Alright, alright. You HATE running, noted. Now let's talk about your book. Dracian Legacy is a paranormal novel. What made you write a story under that genre? Is it a genre you frequently read? I’m a HUGE paranormal fan. I used to read everything that was paranormal in 2012. Everything Paranormal intrigued me. The weres, vampires, Greek gods, angels, the whole she-bang. And so when I started writing Dracian Legacy, I was so captivated by a relationship between best friends and wanted to add a paranormal twist into it. 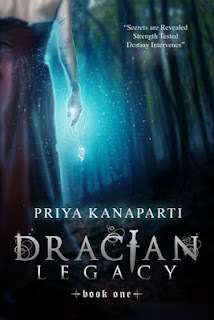 So Dracian legacy, became a Paranormal-Fantasy. There are a lot of different and err, some weird, sounding names of people, places and well... non-humans in your book like Dracia, Axel, Ren and the Proxy Succubi. Don’t get me wrong, I totally love how they sound. Personally, I think names in a paranormal novel add to the world-building. A kickass book needs kickass names in it. I’d just like to know how you came up with the different sounding names. Lol. *psst* come a little closer. I don’t know either! Lol. Seriously, some words just pop into my head and I start looking them up in Google and one thing leads to another and I start mixing and matching words and bam, the new words, people, places form. As for Axel, his name is Alexander and I didn’t want to use the typical nicknames everyone does, SO I once again played around and Axel seemed very different so I made that his name. I particularly liked how vivid the action scenes were. What was it like writing those? I LOVE action movies. So when I write these scenes, I start picturing the scene in my mind and that’s how I type them out. Then I read it, re-write, re-read, re-write, until the scene on paper matches the scene in my head. Was there ever a time while writing Dracian Legacy where the story felt like it was “writing itself” and you had to deviate from what you originally planned? Absolutely! I had to rewrite Dracian Legacy 10 times, before the characters left me alone! Every time I’d rewrite it, the story drove itself on autopilot. I reckon me asking this isn’t really a spoiler because girls are fangirling over Dean like crazy when the blurb says Ren and Axel. They’re bound to know. *shrugs* So I’m going to ask: what made you include a love triangle in the story? Honestly? I always wanted Dean to be with Ren. That was my original plan. Then Axel weaseled his way into the story and I couldn’t help falling for him! But then I didn’t want Dean to be left alone and Dean seemed to agree, so I let them be. About Ren... what was the inspiration behind her character? Dean. Lol. Seriously. Dean’s character was the first one I created for this story, then Ren’s character gave birth as a girl that was his best friend, a girl that wasn’t very brave or open with anyone else but him. A girl that loved him unconditionally, even crushed over him all the while he ignored her. A girl that he too loved and didn’t mind letting her see his vulnerabilities. Then as I re-wrote the story, the inspiration was, how could one person coup with loosing so much in their life and being told they had the responsibility of the world on their hands. Would she cave under pressure and who would she turn to in need. Her BFF since birth or the new found undeniably gorgeous crazy attraction. Woah. Dean really is a big part of Ren. I kind of feel jealous for Axel now. That’s possible, right? Feeling jealous for some other person. Quick question: Axel and Dean are arm wrestling... the image is mind blowing. I can’t eve- holy crap biceps. *stares into space* I, uh... oh yeah question is – who wins? Dean! No question. Lol. He’d totally cheat. To end this interview, please share what readers can expect from Dracian Legacy. Hmmm… Okay. So originally I had 3 books planned for Dracian Legacy. But as I was punster-plotting book 2, I had to plot out a novella. It’s in between Book 2 and Book 3. It’s a huge secret. But I’ll reveal it here okay? *gasps* OKAY!!! Go for it! It’s going to be in DEAN’s POV. EEEEP and I’m SUPER excited about this. And it’s going to be around 12k words of Dean..
Tyler and the gang! Bwahaha…. i would have a knife. The love triangle made me curious about Dean's role. Hmm..
gun, its easy to hit with it.